WUSA9 is hosting free health expo with the Reston Hospital Center and the YMCA Fairfax County Reston. 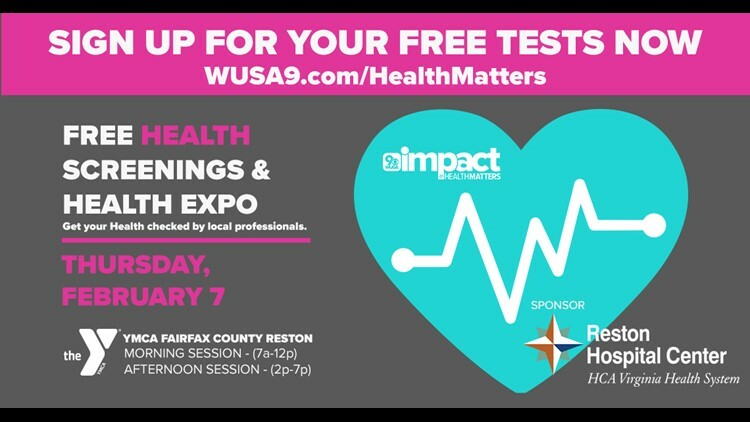 RESTON, Va. — WUSA9 wants to help you take care of your health this month by offering information and free screenings in Reston,Va., because your Health Matters. Come join us! We're hosting a free health expo with Reston Hospital Center and the YMCA Fairfax County Reston. Want to participate in our free screenings? Come to the YMCA Fairfax County Reston at 12196 Sunset Hills Road in Reston, Va. between 7 a.m. and 12 p.m. and 2 p.m. to 7 p.m. on Thursday, Feb. 7. Which session: morning or afternoon?